The Isuzu Elf (Japanese: いすゞ・エルフ) is a medium duty truck produced by Isuzu since 1959. Outside Japan it is known as N series. The range was originally mainly available in Japan and other Asian countries. Australia was another important market for the Elf and N series – to the extent that it was manufactured there from the 1970s using many local components. Since the early 1980s, it has also been sold and built in the United States (under the Chevrolet and GMC brand as a W series), and also as the Isuzu N series. North America only receives the wide-cab version. For the common Andinian market (including Chile and Peru), the truck has been assembled in the GM-Colmotores assembling plant in Bogotá, Colombia since 1991, with annual quantities already of 20,000 up to 60,000 units. Local assembly has been increasing because of increasing demand in the Colombian and neighboring markets. It carries "Tecnología Isuzu" (with Isuzu Technology) lettering. In Indonesia, Philippines and several other countries, the Elf is not only used as trucks, but also converted into microbuses by local body makers. The lighter four-wheeled models are commonly used as an intercity Angkot (share taxi), as a school bus, or as an employee bus. The cab-over 2-tonne (4,400 lb) Elf (TL221) was originally introduced in August 1959. It was originally only available with the 1.5 litres (1,491 cc) GL150 petrol engine with 60 PS (44 kW). It had single headlights and rear-hinged doors. A longer wheelbase version, on 2,460 mm (97 in) versus the 2,180 mm (86 in) of the regular version, was also available. This carries the TL251 chassis code. 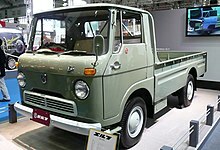 In March 1960 a 2-liter diesel engine with 52 PS (38 kW) was introduced (TL121/151), a first for the class in Japan - this was soon followed by diesel models from Isuzu's competitors. In 1962 the engines were updated, and now have 72 and 55 PS (53 and 40 kW) respectively. The chassis codes were changed to TL321/351 for the diesel version, reflecting the installation of the all new DL201 engine. A little later, the chassis codes were reorganized and were now TLG10/11 for the petrol models and TLD10/11 for the diesels. In 1964 the long wheelbase model became the standard version. In 1964 the diesel was also upgraded to the larger 2.2-litre C220 with 62 PS (46 kW). In 1965 the front was redesigned, now with twin headlights. Isuzu ended up offering a very wide variety of bodyworks for the first Elf. There was the original integrated bed, as well as a separate truckbed with dropsides. There was a double-cab version available, as well as special bodywork for dedicated purposes such as a soda truck, a dumper, and a tanker. There was also a "Route Van" model with a glazed rear compartment and seating either three or six, as well as the "Elf Bus" which was available in two models from 1960. The Elf Light Bus has integrated bodywork and the long wheelbase and seats 21 passengers (chassis codes BL171/271 for the diesel/petrol) while the Elf Micro Bus fit into the very narrow slot between the Route Van and the Light Bus. The Micro Bus originally had the Route Van's bodywork but was more passenger oriented (seating 12 or 15). It carried the TL121/151/21/251B chassis codes, and from 1961 it received its own rear bodywork with bigger glazing. The Elf Bus later became its own line, called the Isuzu Journey. In August 1967 the all-new "Isuzu Light Elf" was added to the existing lineup; this lighter duty version was rated for a 1.25-tonne payload (2,800 lb). It had single round headlights and a KA-series chassis code; it came with the same 1471 cc G150 engine as fitted to period Isuzu Belletts, providing 68 PS (50 kW). This was the first of the second generation Elfs to be introduced, heavier duty models soon followed and replaced first generation variants. In April 1968 the second generation Elf appeared (TL21/TLD21 series). A walk-through van ("Elf Hi-Roof") was also introduced, another first for Japan. In September 1969 the "Light Elf" was upgraded to 1.5-tonne (3,300 lb) and now offered a more powerful 1.6-liter engine (G161AB) with 75 PS (55 kW). In October 1970 this part of the range became the Elf 150 while the regular Elf (2-2.5 tonnes) became the Elf 250; the 250 was updated to a 2.4-litre diesel engine. This was combined with the introduction of the heavier duty, 3.5-tonne (7,700 lb) Elf 350. This re-shake of the lineup was then followed by the very modern Elf Mi-Pack in April 1972. The Mi-Pack was a front-wheel drive model with a flat and low loading floor, only 450 mm (18 in) off the ground. Because of its high price combined with customer reluctance to a front-wheel drive truck it was retired after only a few years on the market. Instead a low-floor model of the Elf 150 was added to the lineup in 1974, featuring small twinned rear tires. The heavier duty Elf 350 was not immediately replaced but continued in production until the 1980 model year, when in February a 350 model of the third generation Elf was introduced ("350 Wide"). The third generation Elf arrived in June 1975, in Elf 150 10 ft., Elf 150 14 ft. 6 wheel and Elf 250 forms are standard. It was nicknamed "Tora-san" after Kiyoshi Atsumi's (a famous Japanese actor) most beloved film character which supposedly looked similar. In January 1977 a 250 Low-Flat model was added, followed in 1978 by a facelift and an altered front grille. In 1979 a 3.3-liter 4BC1 engine of the 2-tonne (4,400 lb) Elf 250 and 350 wide was introduced, called the "Elf 250 Super". There was also a "Elf 150 Super" version, has the 2.4-liter C240 diesel engine and The 2.8 liter 4BA1 engine for the Elf 150 14 ft. 6 wheel version and Elf 250 wide with heavy-duty transmission.which was usually installed in the Elf 250. In 1978 Isuzu also sold their millionth Elf. In January 1980 the Elf was updated to meet Japan's 1979 emissions standards, which was also when the design was changed to accommodate a tilting cab. The Elf 250 Wide and 350 Wide were added, with KT and KS chassis codes respectiverly, meaning that the second generation Ef 350 could finally be retired. The Elf Wide has a cabin 1,910 mm (75 in) wide, rather than the 1,690 mm (67 in) cabin used in the TL and KA-series Elfs. In 1981 the Elf 150/Elf 150 14 ft. And Elf 250 are standard using the 4BA1 engine and 4BC1 for the Elf 350 wide. range underwent another facelift, with an updated dashboard as well. For the third generation Elf the diesel engines had been modernized for more ease of operation, while the world's then smallest direct injection diesel engine - the 3.3-liter 4BC2 - was also introduced. It arrived in 1982 and replaced the less powerful 4BC1 which had appeared in 1979. In March 1983 the diesel engines were again modified, reflecting new Japanese emissions standards for commercial vehicles. While the third generation Elf was mostly replaced in 1984, the "Route Van" (three- or six-seater van version) continued in production until the early 1990s. With the same bodywork there was also a more habitable bus version available; this was marketed as the Isuzu Journey S and was built on Elf 150 basis (KAD51ZB). The fourth generation Elf range appeared in July 1984. This Elf was exported widely across the world and manufactured in several different countries, including the United States. It was sold as the Chevrolet Tiltmaster, and also as the GMC Forward. GMC's Forward replaced their L series and has a 165 hp (123 kW) turbodiesel straight-six engine. It was also the first model to use the long-running Isuzu N-series label. In 1986 a heavier duty 220 hp (164 kW) 8.4-litre diesel version of the Forward was added to the US market. In Japan this generation was only offered with direct injection diesel engines, introducing the new 2.8-liter 87ps 4JB1 family industrial version with dual mode transmission depending in application.and the 3.6-liter 4BE1 direct injection engine for the Elf 250 and Elf 350 NPR. which replaced the long running 4ba1 as the standard Elf 150 10 ft. And Elf 150 14 ft. 6 wheel. In September 1987 a 16 ft. heavier version Elf 350 wide has arrived. With The long stroke direct injection with dual mode manual transmission 3.9-liter 4BD1 and 4BD1 turbo diesel engine and the four-wheel drive version of the Elf 250 was introduced, this was originally only available with the 110 PS (81 kW) 4BE1 engine. The fourth Elf/N series originally had twin rectangular headlamps and a grille with five separate segments (seven for the Wide Cab models). In February 1987 a facelifted version with a grille of only two larger segments appeared, at which time the engine lineup was also altered. This was followed by a second facelift in June 1990, after which the grille became a single. lower opening and the headlights were changed to more aerodynamic, single-piece units. This model was also manufactured in China, by BLAC (Beijing Light Automobile Corporation) from 1984 until 2002. Later it was also built by YCACO, a subsidiary of Guangzhou. After a company reorganization it has been built by them as the Guangzhou Hino 300J (YC5040XXY) since 2008, with a redesigned front and various other improvements. The fifth generation Isuzu Elf appeared in July 1993, with more sculpted headlights. The 2.8 4JB1 and 4JB1T are standard on both Elf 150 10 ft/14 ft. and Elf 250 along with 3.6 4BE1. The non turbo 4JB1 features a new VE Rotary injection pump which increase power to 90ps and euro emission. In May 1995 it received a minor change, including upgraded, cleaner diesel engines. The H-series 4.0-liter 4HE1 and 4.3-liter 4HF1. The 16 ft. Chassis with H-series engine are standard while the 14 ft. Version are still in production. OEM deal with Nissan led to the Elf also being sold badged as a Nissan Atlas and a Nissan Diesel Condor 20/30/35 beginning at this time, followed by the Nissan Atlas Max from 1996 until 2000. The Atlas Max was based on the new, lighter duty Elf 100 (June 1995) which was available with a 2-liter petrol or a 2.5 or 2.7-liter diesel engine. In the U.S. the Elf was marketed as the Isuzu NPR and Chevrolet/GMC W series, each available with either the 4HE1 4.8-liter turbocharged diesel engine or GM's L31 Vortec 5.7-liter gas engine and 4L80-E Automatic Transmission. The gas engine produced 275 hp (205 kW) to 325 hp (242 kW) at 4600 rpm and 330 lb·ft (447 N·m) to 350 lb·ft (475 N·m) of torque at 2800 rpm. In May 2004, subsequent to a few minor changes, the Elf underwent a more major facelifts with new, larger, trapezoidal headlamps. Another OEM deal was forged at this time and the Elf was now also marketed as a Mazda Titan in parallel. In Malaysia, this truck is manufactured by Heavy Industries Corporation of Malaysia (Isuzu HICOM Malaysia) under the name of HICOM Perkasa, but carrying the Isuzu N-Series Commando badge. The sixth generation Elf/N series was released in December 2006 (High Cab and Wide Cab) and February 2007 (Regular Cab). By the time the full range was available, the fifth generation Elf was retired. This was also assembled in Colombia (alongside the heavier F series), where it was sold as the Chevrolet NKR, NPR, or NQR. GM began assembling Isuzu trucks in Chile in 1984. The headlight-turnsignal cluster is now configured in the shape of the Isuzu "twin bar" logo, which was used from 1974-1991. In North America, GM sold the Isuzu N series as the Chevrolet and GMC W series until 2009. In 2016, it reintroduced the model as the Low Cab Forward (LCF) series, named simply the Chevrolet 3500, 4500, or 5500, and available with the same gasoline or diesel engines. The design of the 6th-generation Isuzu Elf cabin bears some resemblance to an all-fiberglass cabin fitted to trucks made by the Brazilian company Agrale since 2003. Agrale introduced an all-steel Chinese copy of the Isuzu wide cab to its truck range in late 2015, but the fiberglass cab was not phased out. The Elf is sold as an Elf in some markets aside from the domestic Japanese, such as Mexico and Indonesia, but in most export markets it is called the Isuzu N series. The second letter denotes weight rating, with H and K being used for the regular cab, M for the High Cab, and P, Q, and R for the Wide Cab model. The third letter denotes drivetrain layout; here an R means rear-wheel drive while S signifies four-wheel drive. ^ LEUTE, JAMES P. "Thursday is last day of production as Isuzu line comes to end". gazettextra.com. ^ Ozeki, Kazuo (2007). 日本のトラック・バス 1918~1972 [Japanese Trucks and Buses 1918-1972:] (in Japanese). Tokyo: Miki Press. p. 68. ISBN 978-4-89522-494-9. ^ "いすゞTLシリーズ マイクロバスの系譜　（いすゞ編＿１）" [Genealogy of Isuzu TL series microbus (Isuzu first edition)] (in Japanese). 403 Forbidden. Retrieved 2014-01-12. ^ "Beijing LAC Китай" [Beijing LAC (China)]. Книги и Каталоги (Books and Catalogues) (in Russian). За рулем. Archived from the original on 2011-08-19. ^ 牛汉华 (Niu Han Hua) (2012-03-29). 高效城市物流 8款高端蓝牌轻卡车型推荐 [Eight efficient urban logistics blue-plate truck recommendations]. 卡车之家 [House of Trucks] (in Chinese). ^ "Chevrolet alcanza el récord de 20.000 camiones armados en Chile" [Chevrolet reaches record 20,000th truck assembled in Chile] (in Spanish). General Motors. 2008-06-19. Archived from the original on 2009-02-14. Wikimedia Commons has media related to Isuzu N-Series. Wikimedia Commons has media related to Isuzu Elf. This page was last edited on 13 February 2019, at 02:49 (UTC).